It’s no secret that aging takes its toll on sight. Over the years the surface of the cornea—the eye’s clear outer covering—flattens, admitting less light into the eye. The thickness of the macula—the part of the retina used for reading and seeing fine details—also becomes thinner. Free radicals generated by sunlight, environmental toxins and even normal body functions cause many of these changes. Poor diet also contributes to visual problems as we age. Left unchecked, these factors can eventually raise the risk of age-related macular degeneration (AMD), cataracts and glaucoma. These three conditions are the most common causes of vision loss in people over 40. AMD occurs when cells in the macula begin to deteriorate and it can cause the loss of central vision. Glaucoma damages the optic nerve and causes vision loss and blindness. But these age-related visual changes aren’t inevitable. You can protect, even enhance, your eyesight. The first thing I recommend to my patients concerned with age-related vision changes is that they start taking supplements that support vision health. Eye supplements contain compounds that are clinically proven to quench the free radicals that can damage sight, as well as nutrients that can actually sharpen your vision. These two carotenoids are responsible for the vibrant red and orange colors in some fruits and vegetables. They also happen to be naturally present in the retina where they act like “sunglasses,” screening out ultraviolet rays, and preventing damage to cells in the eye by acting as antioxidants. Both increase the retina’s macular-pigment density, which protects it from degenerating or tearing. Harvard researchers found that a daily dose of lutein—about what you would get by eating roughly one-fourth cup cooked spinach—lowered the odds of macular degeneration by 43 percent. Another lutein study showed improvement in visual function in one or both eyes of subjects with macular degeneration. And because lutein filters out UV rays, cataract risk also dropped by up to 65 percent in those who consumed lutein five or more times per week, according to another study. Bilberry, a European version of blueberries, is called the “vision herb” because it improves night vision and can prevent glaucoma, cataracts and computer-vision fatigue. Its antioxidant flavonoid compounds also strengthen retinal capillaries, and can prevent or treat early-stage macular degeneration. New evidence shows that the anthocyanidins in bilberry protect retinal ganglion cells—a type of neuron in the retina—against damage. Ginkgo has become an adjunct in the treatment of AMD and glaucoma because it fights free-radical damage in the retina and improves blood flow in the optic nerve—a good thing because the retina demands a steady supply of oxygen and nutrients. In one six-month study, people who took a standardized ginkgo extract twice daily significantly improved their long-distance vision. 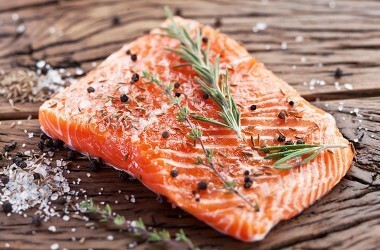 Omega-3s are thought to improve vision because DHA is naturally concentrated in the retina. In the Harvard University-led Age-Related Eye Disease Study (AREDS), which involved about 3,600 people with varying stages of AMD, those who ate fish more than twice a week had a 50 percent lower risk of AMD than those who ate none. Of course, simply popping a supplement won’t give you total protection. You should also take some simple steps every day to protect your eyes. Smoking increases the risk of macular degeneration 2.4-fold in women, depletes antioxidants like vitamin A and causes about 20 percent of all cataracts. If you use eyedrops, choose tear substitutes without preservatives or vitamin A-based drops that provide antioxidant protection. Preservatives in most commercial eyedrops actually decrease the production of tears and can even damage corneal cells. Get at least 20 minutes of exercise daily. Exercise improves circulation throughout the body, including the eyes with their many small vessels, and helps eliminate toxins. It has also been established that glaucoma patients who walk briskly for 40 minutes five days a week reduce their intraocular pressure by approximately 2.5 millimeters—similar to the reduction seen with beta-blockers. Beta-blockers, often used in glaucoma eyedrop treatments because of their ability to lower intraocular pressure, can also cause undesirable side effects such as fatigue, elevated blood sugar levels and weight gain. Exercise offsets all of these potential side effects. To get a comprehensive picture of your eye health, be sure to visit your optometrist or ophthalmologist at least every two years, and annually if you’re over 50. In the meantime, protecting your vision with supplements can help you see more clearly for years to come. Carpentier S, et al. Associations between lutein, zeaxanthin, and age-related macular degeneration: an overview. Critical Reviews in Food Science and Nutriiton. 2009;49:313-326. Matsunaga N, et al. Bilberry and its main constituents have neuroprotective effects against retinal neuronal damage in vitro and in vivo. Molecular Nutrition and Food Research. 2009;53:869-877. Dr. David J. Blyweiss began his medical career as a clinical pharmacist in South Florida prior to earning his medical degree from St. George's University School of Medicine in 1982. His dual background allowed him to appreciate the relevance of conventional pharmaceutical/surgical based treatments in acute medical conditions, and recognize where these approaches fell short in treating the majority of patients who suffered from the chronic degenerative diseases of "western civilization origin." Over the last twenty years, with the nutritional medical knowledge base expanding in the fields of nutrigenomics, protemics, and other related "orthomolecular" disciplines directed towards patients' biochemical individuality, Dr. Blyweiss became an early adherent and experienced practitioner of what would become known as "functional medicine." This knowledge allows him to effectively manage and alleviate the symptoms related to the most "difficult-to-treat" conditions by addressing the underlying causes, allowing the body to heal itself. Dr. Blyweiss was one of the initial researchers doing the early work on chlorhexidine (Phisohex) while earning his first post graduate degree at Temple University School of Pharmacy. During medical school he worked with the WHO (World Health Organization) in vaccinating children in the islands of the Carribbean. He has traveled much of the world, most recently to Belize, Central America, Gabon, Africa, and Zagreb, Croatia working closely with teams of specialists to identify new plant life and natural products for possible human benefit as well as researchers and their stem cell transplantation teams. He has consulted for and created state-of-the-art nutritional supplements for multiple nutritional companies since 1999. He is currently in private practice in South Florida where he resides with his family. I noticed that you did not mention eyebright, an herbal supplement for the health of eyes. It’s only a flower that looks like it has bloodshot eyes, but it is highly recommended for eye health along with bilberries. Plain and simple: How do you unclog the eyes’ clogged drainpipe of glaucoma? Reducing the production of eye fluid with eye drops doesn’t–it just keeps depriving surrounding tissues of their needed nutrition from that fluid, if I understand correctly. So–first things first–how do we unclog the drain channel, before more eyesight loss occurs?